Snappy Premium Teak Oil is an exclusive teak oil from the tung nut tree that grows in China. It is an alternative to Snappy Sealer, if one wishes a darker, prettier and more natural color on their deck. The oil leaves a warm, beautiful color and lasts a long time. Only the finest tung nut oil is used and then an effective UV-protection is added. The mixture goes through a polymerisation process resulting in a unique oil that will last 4-6 times longer than other teak oils. Snappy Premium Teak Oil does not darken and is very easy to apply! 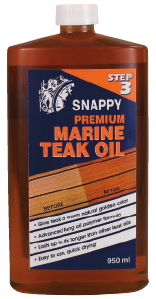 Snappy Premium Oil is especially appropriate for your teak furniture.